Like other cities in Australia, Cairns has got excellent shopping - you'll find anything you ever need. 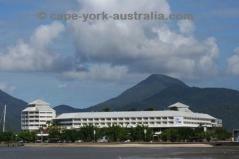 There are many large shopping centres with all kinds of shops, and there are shops and shopping archades in the streets of central Cairns. 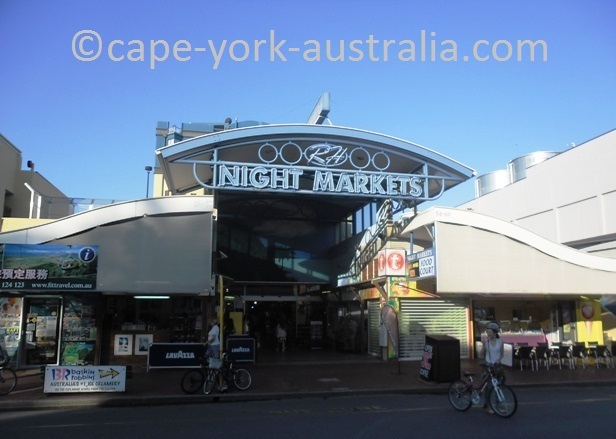 There are also a few different markets; and in Cairns - you can even shop night time as the shops in the central city (and night markets) are open until late at night. 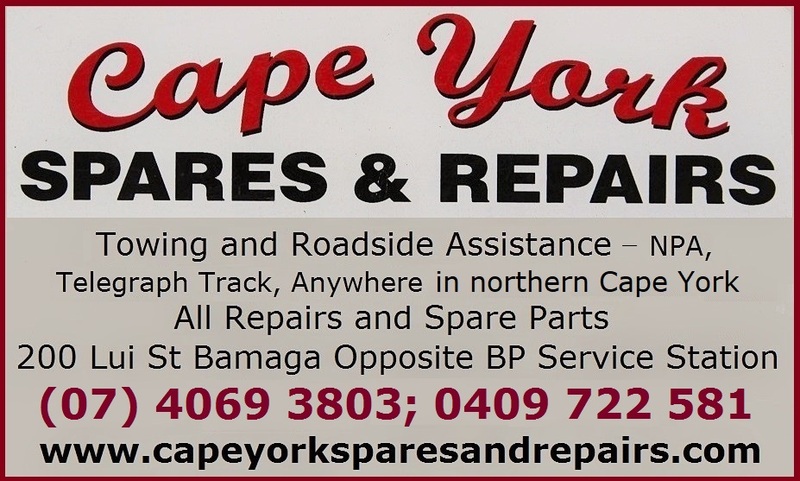 There are plenty of different shops in the streets of central Cairns, between the Esplanade, Aplin Street, Spence Street and McLeod Street. Fancy clothes shops, souvenirs, books, jewellery, shopping archades, the list goes on. 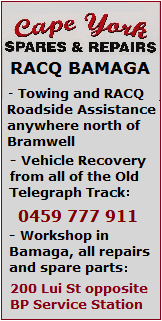 And - they are open until late. There are a few good markets in Cairns. Rusty's Bazaar is good and it sells fruits and veggies as well as clothes and jewellery. Night Markets on the Esplanade sells mainly touristic stuff but also has an Asian food court. Some days there are market stalls on the Esplanade and in the City Place. Cairns Central is the central Cairns shopping centre, and it's great. 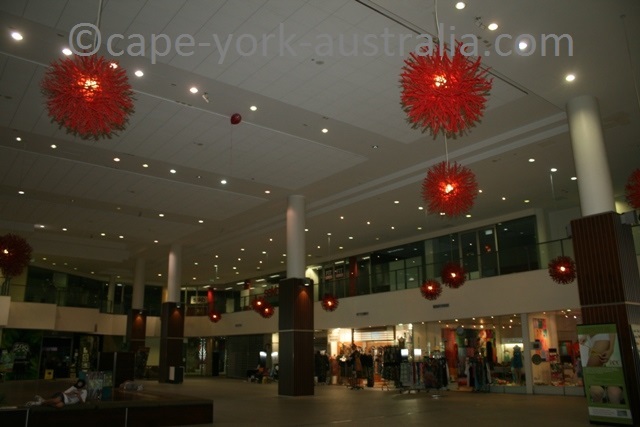 Fashion clothes shops, gifts, books, Camera House, Australian Geographic, lots of jewellery outlets, hairdressers, nail extensions, a great food court, a Sushi restaurant, cinema and so on. The Pier shopping centre is smaller, and gets less crowded since they stopped the Mud Markets. There are clothes, books, movies, games, jewellery, hats, bags, and shoes shops, a tourist info centre, a news agency and internet. Local products markets on Saturdays. 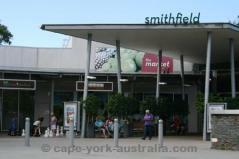 There are many other shopping centres in Cairns - small ones are everywhere but bigger ones include (apart from Cairns Central) Smithfield (northern suburbs) and Stocklands in Earlville (a southern suburb). There is alsothe Raintree in Manunda; and other smaller ones are scattered a bit everywhere. There are a few great Cairns markets. Markets are always fun places to visit and in Cairns there are at least two in the city centre - Rysty's and Night Markets. There used to be Mud Markets in the Pier shopping centre, but they are not there anymore. 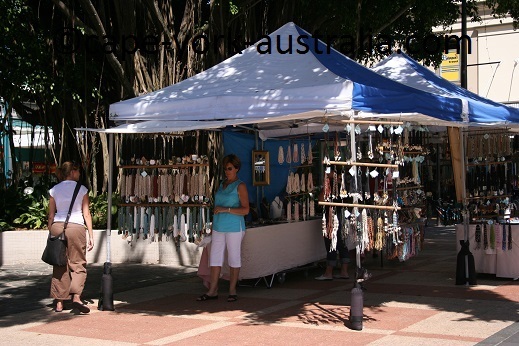 There are also market stalls some days of the week at the City Place next to Cairns Museum; and in the park on the Esplanade, next to the Lagoon. I always remember coming here in the old days for lunch or dinner - they have a food court with some very nice Asian food, and while I haven't eaten here lately, it still looks just as yummy. That said, these markets have lost a bit in reputation in later years, particularly in the souvenir department. In any case, it is right on the Esplanade, not far from the Lagoon, and it's open night time (from 5pm). There are many other shops in central Cairns that are always open night time. It's not a bad way to kill a few evening hours having a dinner out and scrolling through shops and markets. If you like the idea of morning markets better, there is Rusty's Bazaar, which is open Fridays (5am - 6pm), Saturdays (6am - 3pm) and Sundays (6am - 2pm). They sell all sorts of things like jewellery, clothes, arts and crafts. but I like to visit the fruit and veggie department - they are locally grown and often cheaper than in supermarkets. 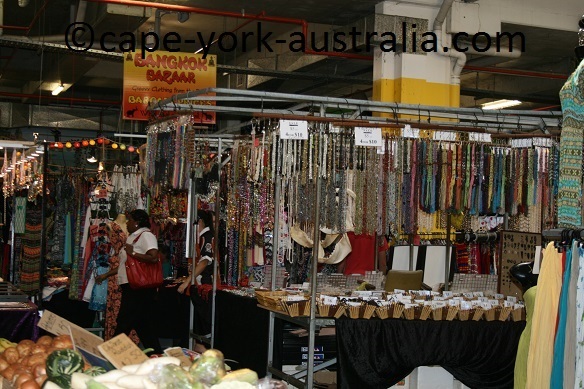 There are market stalls at the City Place from Monday to Friday. 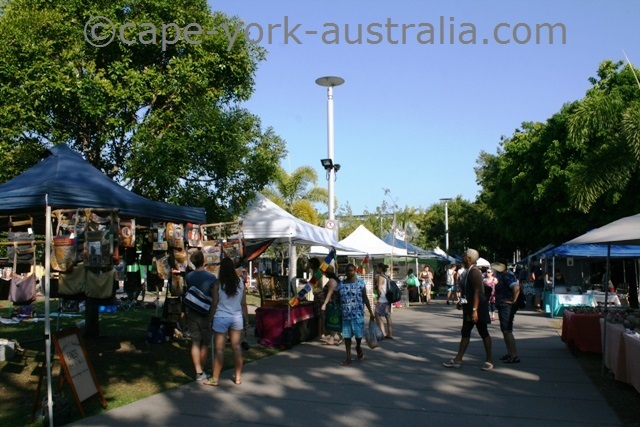 There are market stalls on the Esplanade in Saturdays, just next to the Lagoon. 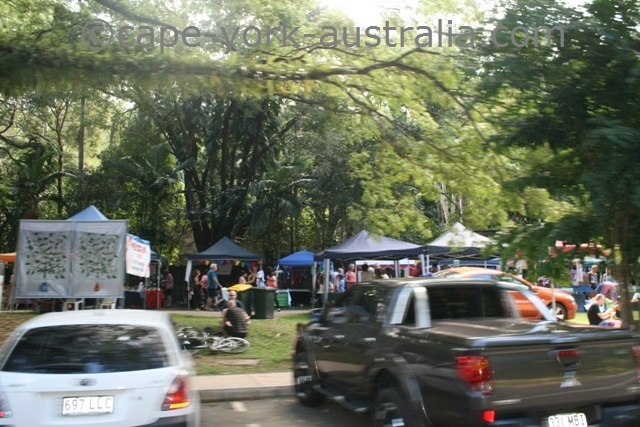 And there are market stalls at the Botanical Gardens on Sundays.